Amazon has 60 million subscribers to their Amazon Prime service, yet only 1/3 of them take advantage of the included streaming platform. How can we differentiate Amazon's video streaming platform from the already-established players? 81% of people use another device while they watch TV or stream their shows. Mobile-Commerce is on the uptrend with 56% of smart device users intend on searching and/or purchasing goods on their device. Creating a seamless experience within Amazon's ecosystem by enhancing their already existing X-Ray feature with behind-the-scenes content, bonus footage, and relevant merchandise that is readily available for purchase in Amazon's shopping platform. 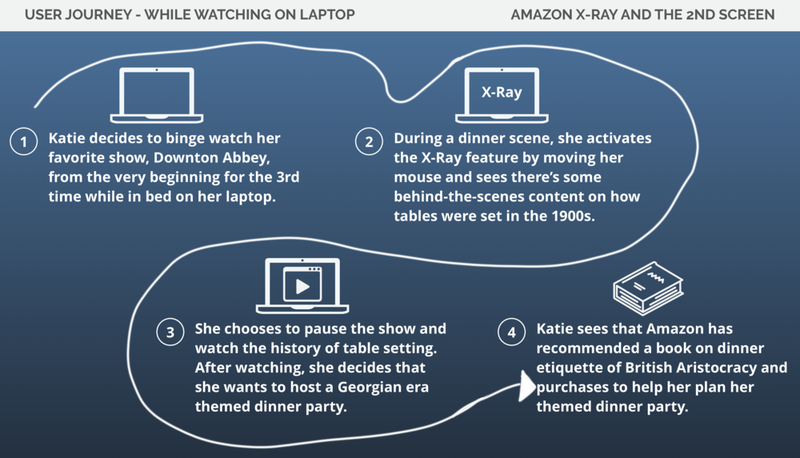 Commercials and targeted advertising are intrusive, but Amazon X-Ray gives their users the power to choose if, when, and what to view besides the show that they are watching. If people don't want to choose and want it all, the 2nd screen feature let's them do just that. Amazon's current ecosystem has a lot of pieces in play, but they all need to work together in a seamless manner where a user would never want to leave Amazon's ecosystem. Enhancing the X-Ray feature is simply a matter of updating what they already have with tangential bonus content and relevant merchandise. Amazon would not be the first to implement 2nd screen technology, Disney and Nintendo have already incorporated 2nd screens into their offerings with success. A user persona that we have dubbed as the Super Fan has a fixation on not just the show and it's story and characters, but also on the world and time period that it is set in. Has a strong passion for her favorite shows which has led her to watch cast interviews, crew commentary, behind-the-scenes footage, etc. Has a strong desire to learn anything and everything that is even remotely related to the show and its characters. Incorporating a 2nd Screen feature on a separate device will keep their viewers fully immersed in the story worlds created by their favorite shows while taking advantage of the newly enhanced Amazon X-Ray. See something in the show that piques your interest, the newly enhanced Amazon X-Ray can scratch that itch for you. Feel free to browse the bonus content and related merch. When you feel ready to go back to viewing your show, it is just a tap away. Or do both. At the same time. Watch your show and browse the content or shop the merch. If a 2nd screen isn't available, bonus content and show merchandise still all live on in Amazon's ecosystem. 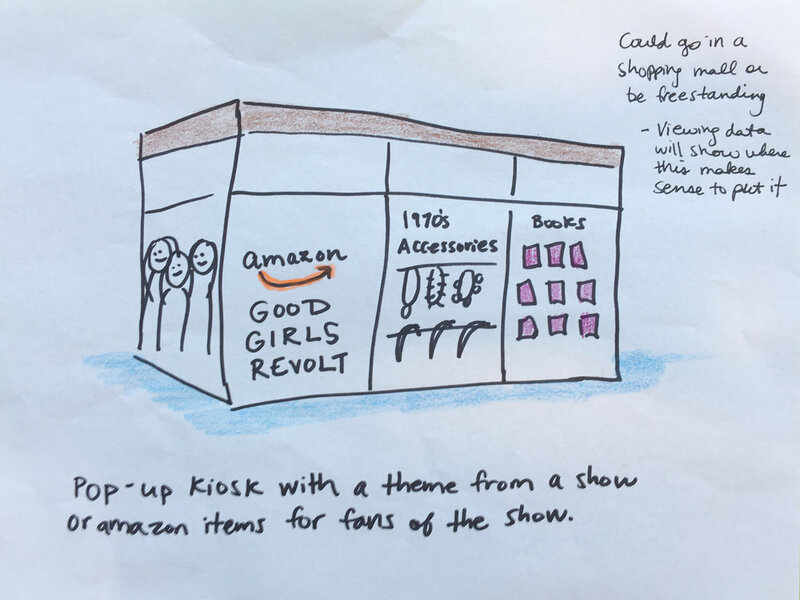 Josh, Allison, and I pushed the idea of combining online shopping and online streaming to create a less intrusive way to showcase merchandise related to the show. 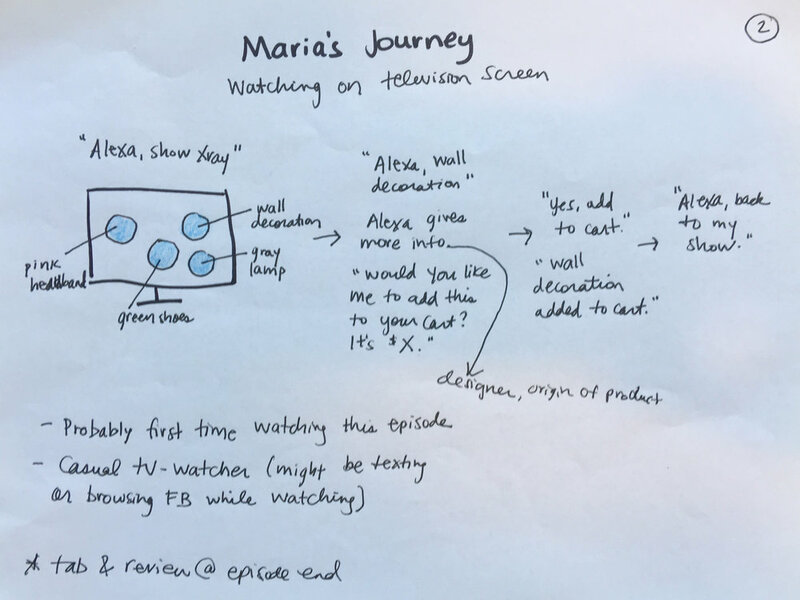 For the video, Josh created the script and was the voiceover talent, Allison created the visual assets, and I created mockups of the 2nd Screen using Sketch and Principle. I then brought it all together in Final Cut Pro.